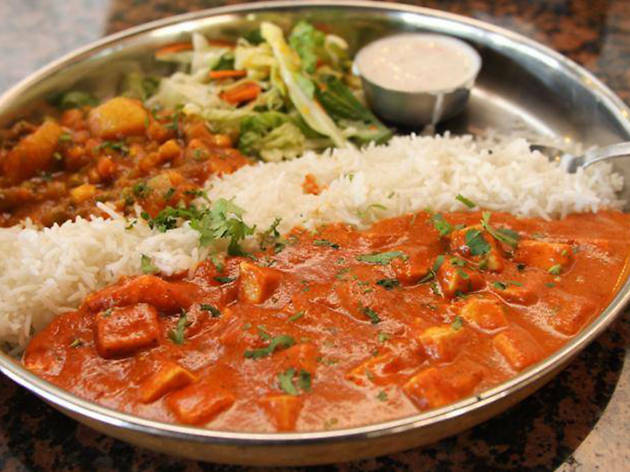 Eating Indian food sometimes feels like an exercise in Comfort Food 101. Pile up a plate with basmati rice, lamb vindaloo and a sizeable wedge of naan, and suddenly the plate is clean and you're already making a second batch. 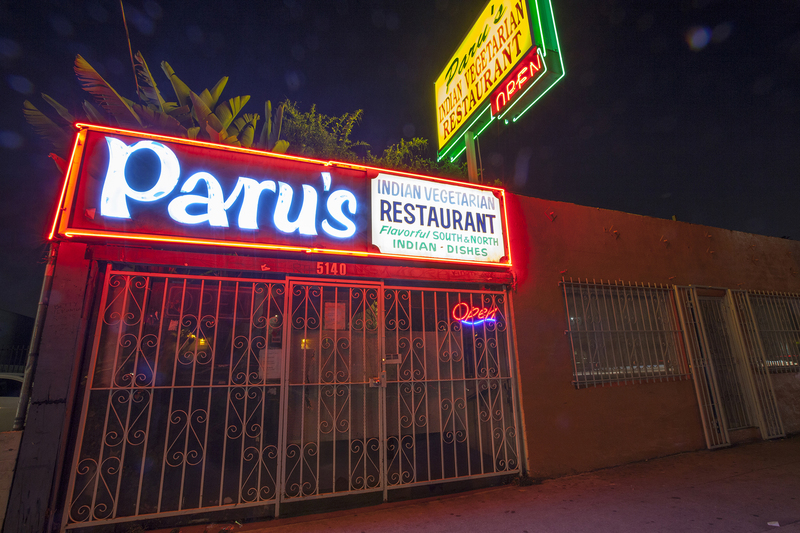 Luckily for us, Los Angeles is rife with Indian eateries, ranging from romantic banquet halls to casual strip mall finds. 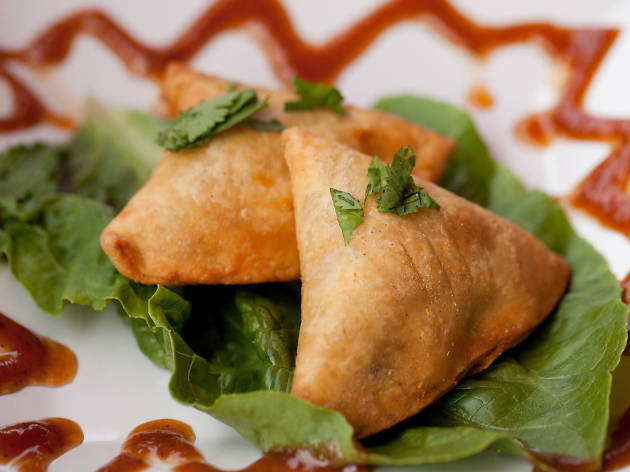 They're in every corner of the city, too—from Artesia to Silver Lake to West Hollywood, these Indian restaurants are serving the best samosas, curries and tandoori in LA. DTLA's modern Indian restaurant is a family affair, with a father and sons team comprised of chef Pawan, Arjun and Nakul Mahendro. 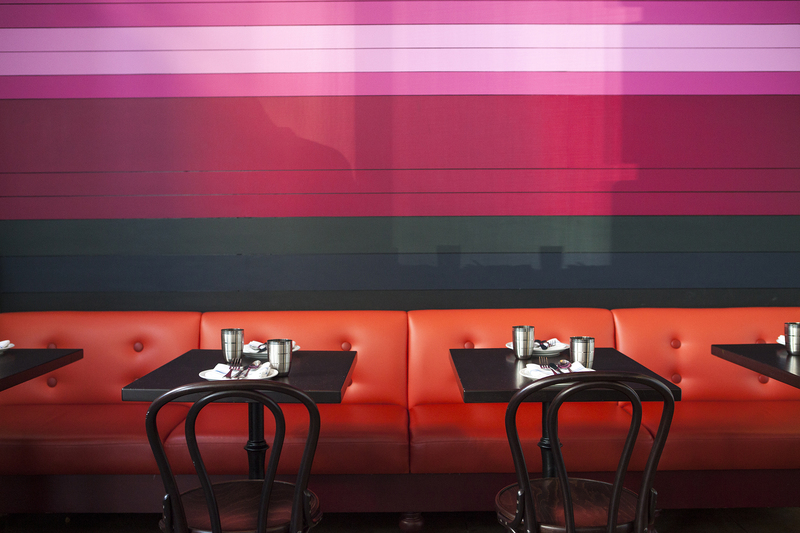 White tiles and black chalkboard walls meet color block banquettes and a central art piece, while vintage Bollywood posters and aluminum tumblers straight from the motherland add authentic flair. Start with street cart classics such as addictive Punjabi Fish Fry; crunchy papri chaat chips served with masala-flavored potato and chickpeas, yogurt and tamarind and mint chutneys; or fried samosas—choose between traditional or butter chicken. 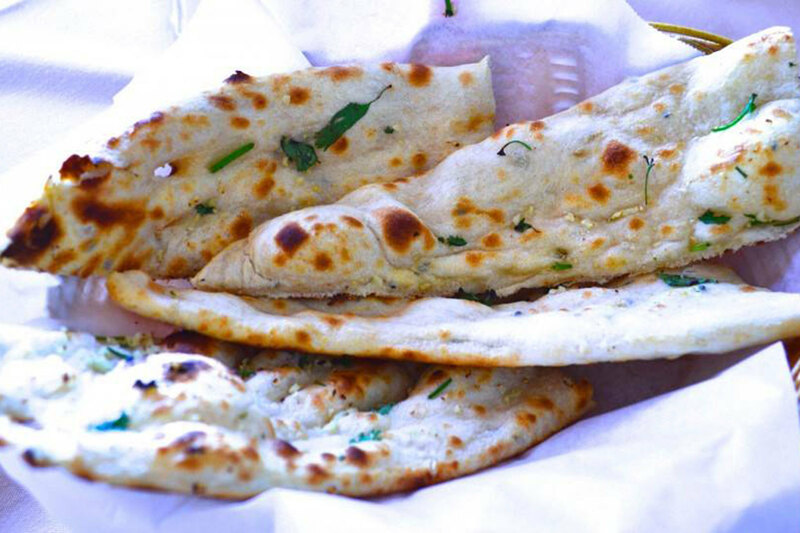 Meat eaters can fill up on the lamb burger or spiced mango pork belly, while old schoolers can opt for butter chicken, good ol' saag paneer and tandoori oven faves like naan and Badass Chicken Tikka. Thirsty? New World wines by the glass and bottle and a limited, yet impressive, selection of CA-local beers by the bottle and can. There are also bottle selections that would make any Indian proud—Limca and ThumsUp, India's version of Coke, and ice-cold Kingfisher lager to quell the heat. If that's not enough, cool down your palate with housemade yogurt lassi in cardamom or mango. Ring the doorbell on the heavy metal gate and you’ll be buzzed into a wholly unexpected patio full of twinkly lights and diners in many variations of yoga pants. 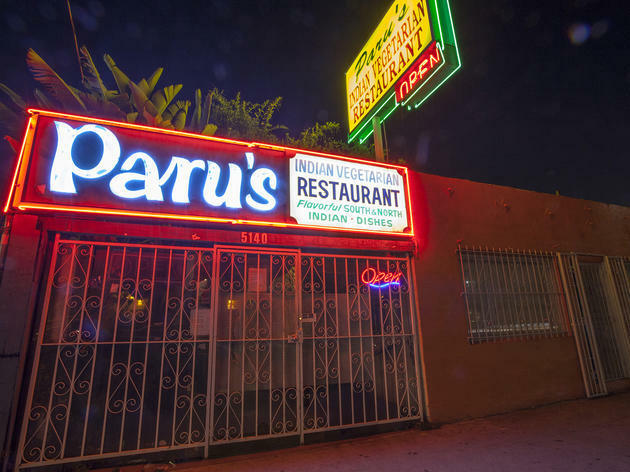 Paru’s serves South Indian food, redolent with spices and herbs that permeate the restaurant’s interior in a warm, piquant cloud that hits you as soon as you enter. The full dinners are the best way to try everything: Indian thali gives you a selection of puri, two curries, sambar (a lentil gravy), rasam (a yogurt-based soup), papad (lentil crackers), pickles and dessert; while the Queen Paru is a creamier choice, with coconut chutney, raitha and ghee to accompany your paper-thin dosa (rice flour crepe) and idli—a savory rice and lentil cake. What started as a large Indian market in Culver City has grown into a fantastic restaurant in Silver Lake, a cafeteria-style eatery serving incredible food. 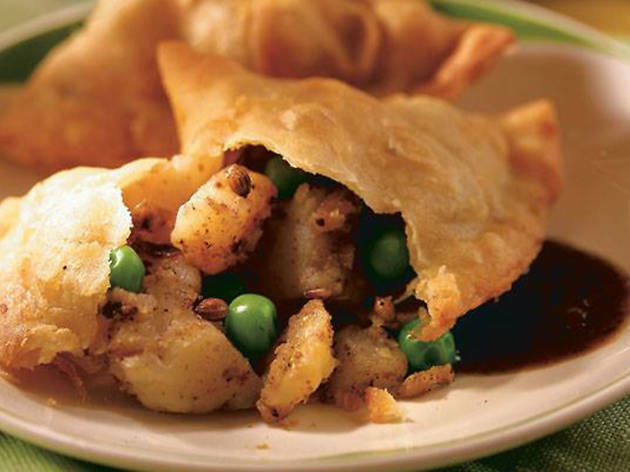 For vegetarians, it's a safe haven to find meat-free dishes that don't skimp on flavor. For non-vegetarians, well, it's just as enticing. 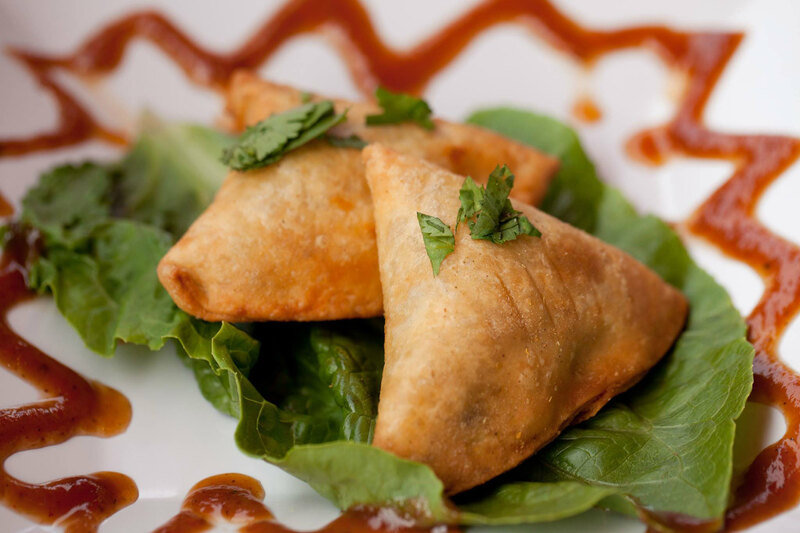 Samosas are large and fried to perfection, and you can get your money's worth by opting for a combo platter: three sides with rice, bread and raita or soup. To wash it down, a mango lassi is your best bet (they even have a vegan version!). 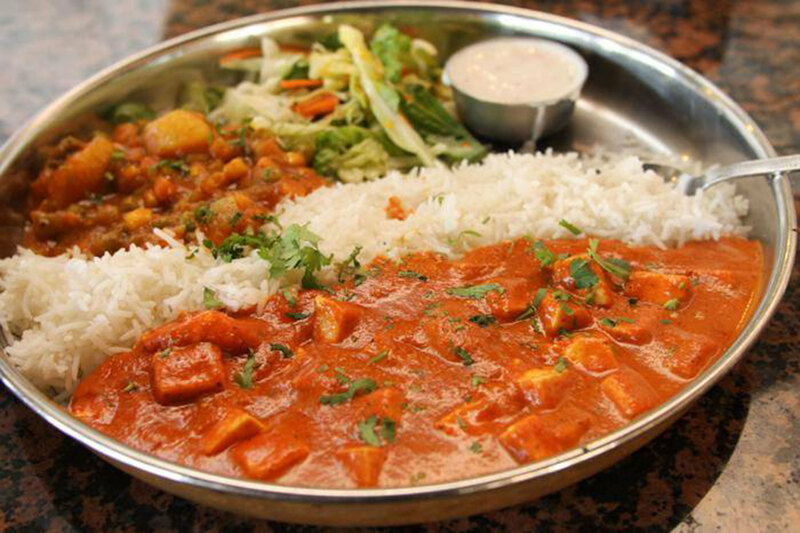 Rajdhani is located along a stretch of Pioneer Boulevard in Artesia known as Little India, where Indian restaurants and spice shops are aplenty. What makes this particular eatery stand out, though, is western India. 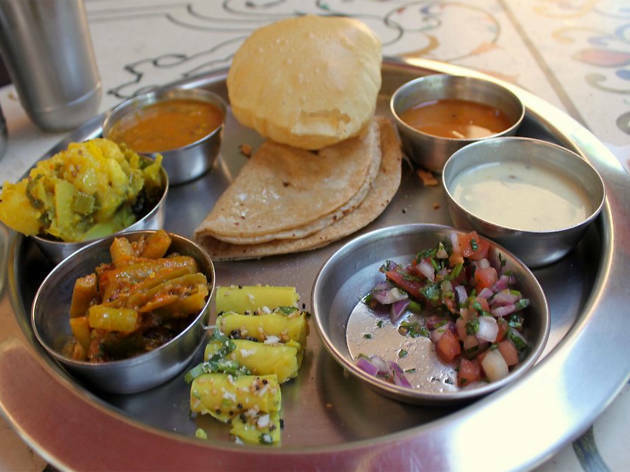 Despite being situated by the sea, Gujarati is known for its vegetarian—not seafood—dishes, and Rajdhani is no exception. 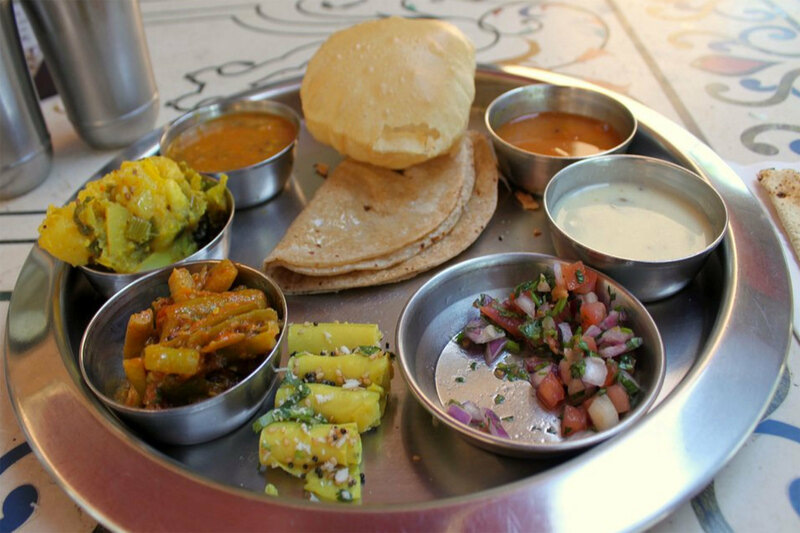 Waiters bring dishes tableside (there's no buffet here), so you can get up close and personal with platters of thali—a selection of daal, chapati, okra stew and more. End the meal with some of Rajdhani's excellent desserts, like rose ice cream topped with basil seeds. Is there an Indian restaurant in LA more romantic than Electric Karma? Probably not. 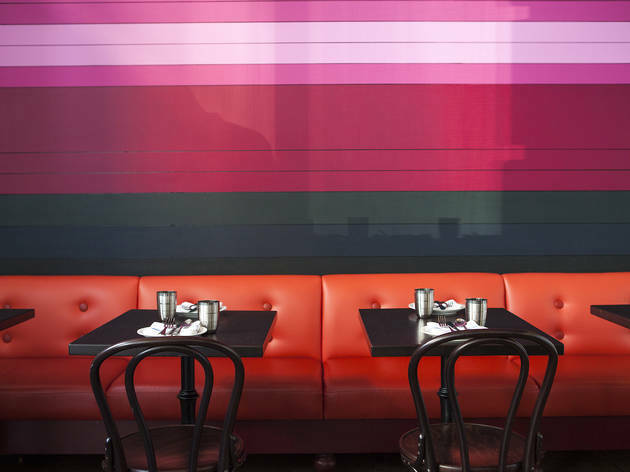 The dreamy West Hollywood eatery serves Punjabi cuisine in a setting that oozes seduction, with flickering candles, tasseled garden umbrellas and lanterns that set the mood. At night, Bollywood films are projected above the main dining room as world music plays softly in the background. 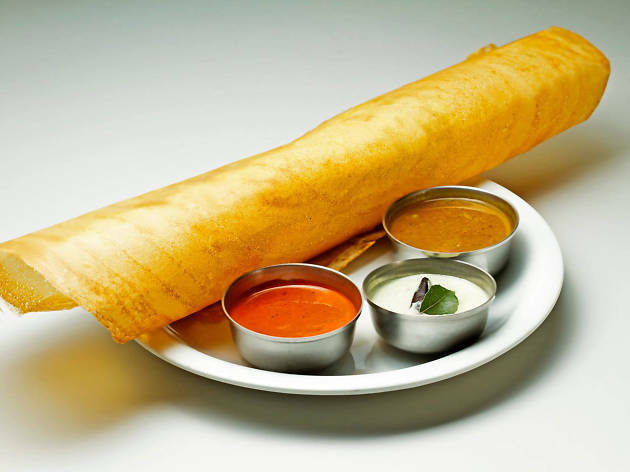 Start with a few appetizers that include traditional vegetarian samosas seasoned with tamarind and sweet tomato chutney, sambar soup and cheese naan with mango chutney, followed up by palak paneer with tofu, Chicken Frankie (a sort-of Indian burrito) and masala dosa. Don't let the prospect of an inexpensive lunch buffet cause you to question East India Grill's quality. 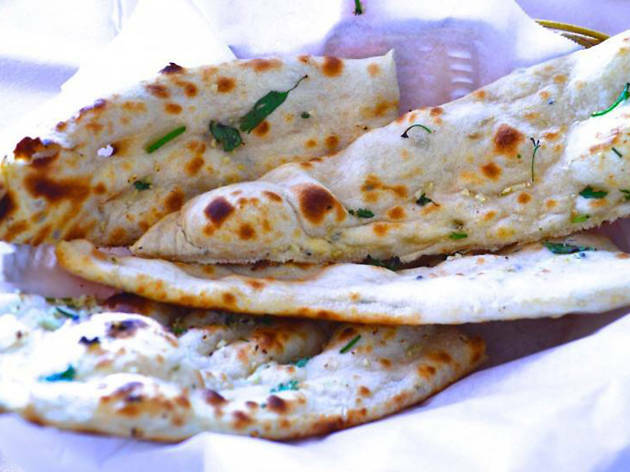 Since 1986, the La Brea restaurant has been serving traditional Indian cuisine with homemade spices, offering lunch and dinner dishes that range from tandoori plates to their popular mango ribs. Parking in the area might be a beast, but inside you'll be able to decompress on the restaurant's airy patio (for a more formal experience, the fancier dining room might be best). Start with curried mussels or paneer tikka before moving onto the heftier tandoori and curry combos (served with rice, lentils and yogurt), a large selection of naan, sides and a creamy scoop of mango ice cream or rice pudding to finish. Of course, there's always that lunch buffet. 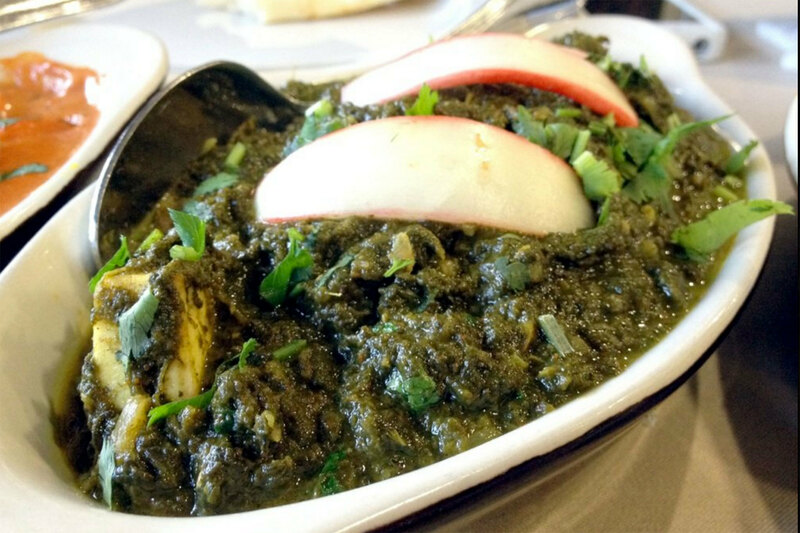 Found along a stretch of the breezy PCH, Bombay Tandoori & Banquet is a popular destination for South Bay locals—especially those in search of a solid lunch buffet for $11. Fill your plate with basmati rice, lamb vindaloo, chicken tikka and shahi paneer, or order à la carte and tuck into creamy shrimp masala, gobi manchurian and goat biryani. 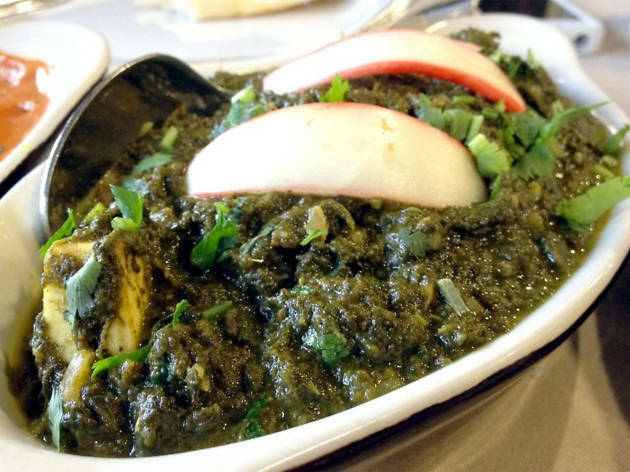 Diners can order combos for dinner as well, like the Bombay Shakahari Bhojan, which includes naan, basmati rice, daal makhni, alu gobhi, and your choice of saag paneer or baingan bharta and salad or raita. Smack dab in the heart of West Hollywood, India's Oven is located on the second floor of an office building, decked out in grandiose banquet tables and the occasional Bollywood movie projected on the wall. Luxury here is more of a suggestion, though—the lunch buffet is only $10, and diners stop in for a casual family dinner throughout the week. Chef Kamal Singh cooks up comfort food in the form of paneer tikka, samosas, lamb shahi korma, reshmi kabab and more, along with traditional desserts like gulab jamun (cheesecake balls in syrup) and Indian rice pudding. 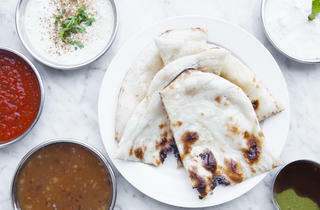 Mayura's cuisine is inspired by Kerala, a coastal city in South India. 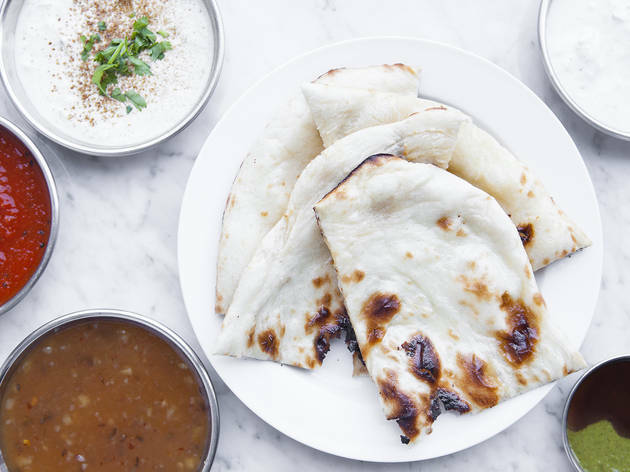 Cuisine from this area is heavy on the spices and sour sauces, so at Mayura you'll find dishes rich with cumin, coriander, turmeric and cardamom and creamy stews that sway more sour than sweet. 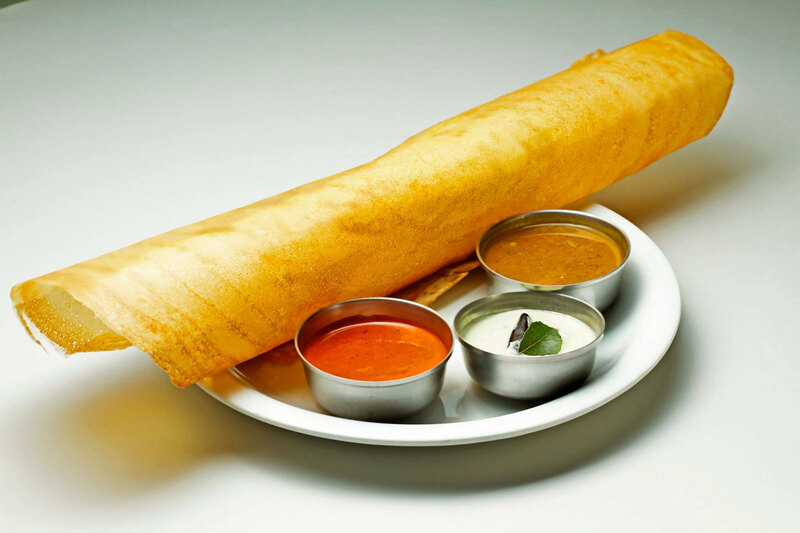 You'll also find uthappam: a pizza-like concept that features various toppings cooked into dosa batter. 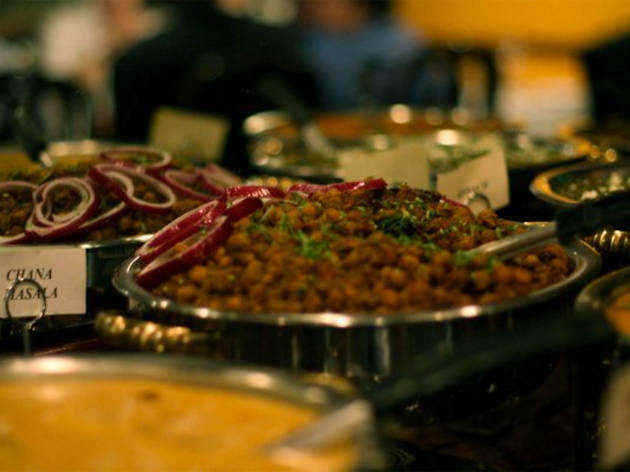 Other fantastic options include palak paneer, puttu (steamed cylinders of ground rice layered with coconut), upma (porridge cooked from semolina and vegetables), and classic dishes like chicken tikka masala, lamb vindaloo and vegetable biryani.